An RT crew has gained access to the strategic Tabqa dam, partially recaptured by the Kurdish-led Syrian Democratic Forces with the help of US troops who were deployed to Syria to “train, advise and assist” but who were spotted just miles away from Raqqa frontline. 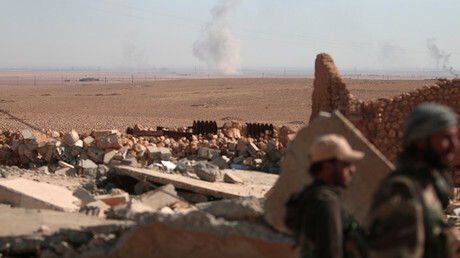 While exploring the northern side of the SDF-controlled part of the Tabqa dam, the RT crew – which became the first international news channel to film there – managed to catch a glimpse of US soldiers embedded with the Wrath of Euphrates operation. Besides capturing what Kurds called American artillery pounding the Islamic State (IS, formerly ISIS/ISIL) targets, RT’s Lizzie Phelan also noticed US Marines at the northern entrance to the Tabqa dam. 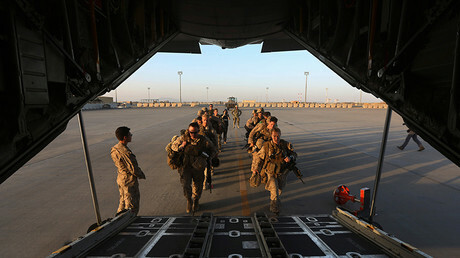 “We managed to capture these US marines leaving the frontline before being ordered to stop filming...,” Phelan says, adding that the US troops are camera shy “for a reason,” as the Pentagon’s official line is that its forces will be kept away from frontline. On camera, the Kurds refused to discuss the US troops and asked RT to stop filming. Off camera, however the SDF fighters openly talked about how, for some time, the Americans have been alongside them on the frontlines in fighting ISIS. Located some 40 kilometres (25 miles) west of the so-called IS capital, the 60-meter-tall Tabqa Dam (also known as Euphrates Dam) supplies electric power to the wider Raqqa region, an area that has been under terrorist control since 2013. The northern part of the Tabqa Dam is under the control of Syrian Democratic forces, backed by American troops. The terrorists, however, still control the most crucial parts of the dam in the south, which includes the floodgates, the control room and the hydroelectric plant. A video recently released by IS terrorists showed the damage an alleged coalition strike had caused to the dam and an unexploded missile inside the devastated control room. The Pentagon and its Syrian allies, however, dismiss claims that their air and artillery strikes somehow damaged the dam. Meanwhile, a team of Red Crescent engineers arrived shortly after the RT crew in another attempt to access the IS-held part of the site but were “once again forced to turn back by the militants mortar shelling,” Phelan said. Should the dam suffer major damage during the anti-IS operation and collapse, it would be a disaster for the entire region which could kill thousands and flood the city of Raqqa. Recapturing the dam is also vital for US-led forces in isolating the area around Raqqa and eventually take the city. US Marines along with their military equipment arrived in northern Syria earlier this year to help the SDF, a multi-ethnic force consisting of Kurdish and Arab fighters to prepare for the offensive. The US troops were officially sent into the Syrian war theatre by the Obama Administration to “train, advise and assist,” and Washington has promised to keep American soldiers out of harm's way and away from the frontline. But with the arrival of the new Donald Trump administration that role is seemingly shifting towards closer engagement with the enemy. While initial deployment has seen roughly 50 US special forces personnel sent to Syria in 2015, over the years, that number has expanded significantly. There are roughly 1,000 US special operations forces, Marines and Army Rangers in Northern Syria today – and that number might soon grow even larger. Speaking to the House Armed Services Committee on Wednesday, US Gen. Joseph Votel, commander of US Central Command said more American troops might be needed to support the SDF offensive to capture Raqqa. Currently an estimated 3,000–3,500 ISIS fighters remain in Raqqa, the US coalition told Newsweek earlier this week. According to reports, the US might be planning to help the Kurds surround Raqqa, while the Arab forces of the SDF would lead the effort to recapture the city. That policy would be consistent with Ankara’s aspirations, as Turkey, who just ended its own Euphrates Shield operation, firmly objects to arming the Kurds or somehow helping them form a quasi-state on its borders. The Syrian leader said the US “didn’t succeed anywhere they sent troops, they only create a mess; they are very good in creating problems and destroying, but they are very bad in finding solutions,” he said, as cited by state news agency SANA.